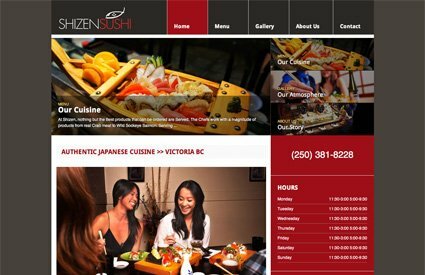 Shizen Sushi offers authentic Japanese cuisine in Victoria BC. You can expect a fine dining experience with a casual atmosphere. The chefs work with a magnitude of products, from real crab meat to wild sockeye salmon. The doors to Shizen Sushi opened for business on August 8, 2006. Since then, Owner/Operator (Newton) Nu Do hasn't looked back. Starting with only one sushi chef and a handful of kitchen helpers, Shizen Sushi has over 25 skilled employees that make the restaurant a joy to come to, any day of the week.